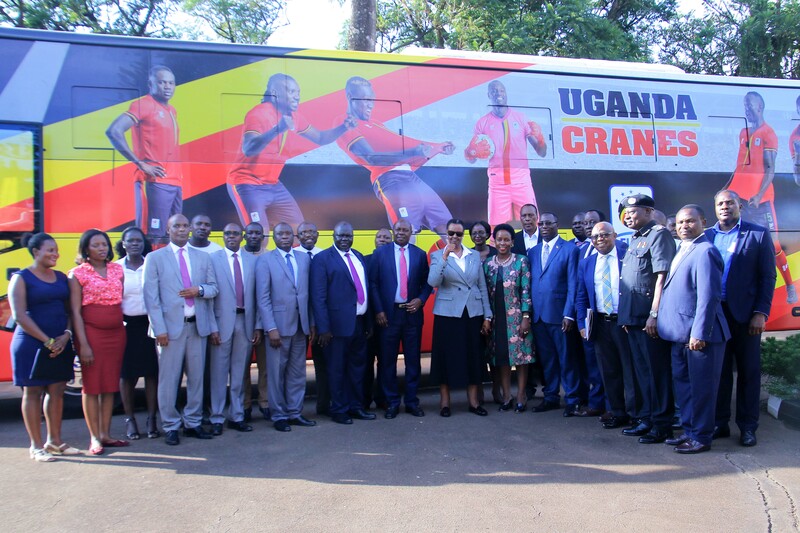 KAMPALA – After successfully qualifying for the 2019 African Cup of Nations (AFCON), the Uganda Cranes have been handed a new team bus by the Government. The bus which was pledged by the President of Uganda HE. Yoweri Kaguta Museveni in Rwakitura last year, was handed over by the Minister of Education and Sports, Janet Museveni. In her speech during the hand over, Ms. Museveni applauded the Government for the efforts towards investing in sports and the kind of motivation that has seen individuals and teams excel at different events. 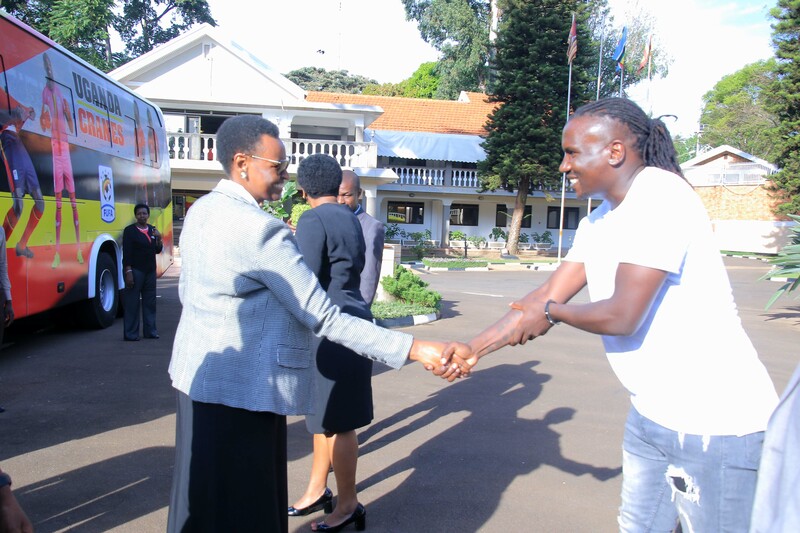 “I hope that the team (Uganda Cranes) will be excited about this bus, noted the Minister. “I am excited handing over this bus because it surely shows the Government’s commitment towards the development of sports in this country. “I want to thank the Government and specifically the President for the immense support that has been extended to sports. The brief function held at State House Nakasero was also attended by officials from the Ministry of Education and sports led by minister of state for sports Hon. Charles Bakkabulindi, officials from the National council of sports with their chairman, Bosco Onyik and acting General Secretary Dr. Patrick Bernard Ogwel. The FUFA delegation was led by 1st Vice President Justus Mugisha who received the keys for the 49 seater bus. The second vice President Darius Mugoye, third vice president who also doubles as state minister for youth and Children Affairs Hon. Nakiwala Kiyingi, Ex Com member Hamid Juma, Deputy C.E.O Humphrey Mandu and Finance Director Decolas Kiiza witnessed the ceremony. Uganda Cranes vice-Captain Hassan Wasswa represented the players while assistant coach Matia Lule also attended. In his acceptance speech Justus Mugisha thanked the Minister on behalf of Government for the consistent support to sports in the country that has resulted into enormous achievements. “We are here to thank you and the Government for the consistent support you have given to sports in Uganda, said the delighted Mugisha. “Thank you also for offering to host us in Rwakitura at the start of last year for that visit has changed sports in unimaginable ways. “Your support has enabled us achieve so much. We also want to thank NCS and the ministry for the support. “However we have one other request, now that we have qualified let the funds be released on time such that the preparations start right away otherwise we promise you we are going to continue making you proud. Despite losing 3-0 away to Tanzania in their last game, the Cranes topped Group L of the 2019 AFCON qualifiers, sealing a spot at the upcoming finals in Egypt.